This image of Earth from lunar orbit was acquired by NASA 's Moon Mineralogy Mapper aboard India's Chandrayaan-1 spacecraft. The blue marble never loses its appeal. 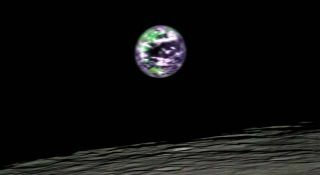 Two spacecraft havebeamed back new pictures of Earth from their vantage point at the moon, whichoffers a view of our planet as a full globe. NASA's Moon Mineralogy Mapper, aninstrument onboard India?s Chandrayaan-1 spacecraft, captured animage of Earth hovering 124 miles (200 km) over the lunar surface. The false-color snapshot, which was taken on July 22 andreleased Aug. 3, is reminiscent of the original "Blue Marble"- the nickname of a photo of the Earth taken by the Apollo 17 crew in 1972. Inboth images, the orb ofthe Earth glows in stark contrast to the blackness of space behind. The Moon Mineralogy Mapper is oneof two NASA instruments onboard Chandrayaan-1, India'sfirst lunar spacecraft, which launched in October 2008. The instrument isan imaging spectrometer designed to compile a high-resolution map of the lunarsurface to learn about the origins of the moon and the solar system'sterrestrial planets. Other, slightly blurrier new shots of Earth from the moonwere recently captured by NASA's Lunar Crater Observation and Sensing Satellite(LCROSS) spacecraft, whichlaunched along with the Lunar Reconnaissance Orbiter (LRO) in June 2009.LCROSS took the new Earth images Aug. 1 as a calibration to check the health ofthe science instruments onboard. "The Earth-look was very successful," said TonyColaprete, LCROSS project scientist. "The instruments are all healthy andthe science team was able to collect additional data that will help refine ourcalibrations of the instruments." LCROSS was able to detect the signatures of Earth's water,ozone, methane, oxygen, carbon dioxide. It also may have been able to detectthe planet?s vegetation as well, researchers said. vegetation. The LCROSS probe is set to watch as its launch vehicle'sspent upper stage strikes down into a crater on the moon's surface in October2009. It will search for signs of water ejected from beneath the lunar surfaceby the crash before making its own impact a few minutes later..